Longtime collector W.G. 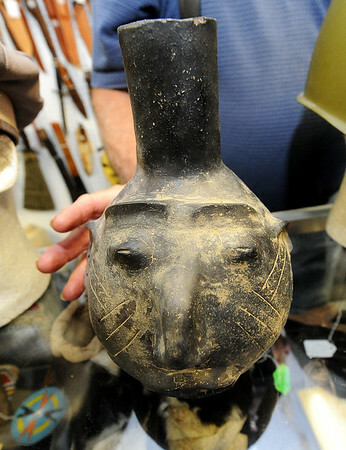 "Trip" Triplett, of Circle T Collectibles in Carl Junction, displays a 1,200 year-old Mississippian head pot used to honor departed warriors. The detail on the pots - often used as seed pots- reflected the engraved scar tatoos and ear piercings of the honorees. Triplett began collecting Native American and military artifacts 71 years ago and has countless items at his store and his home.